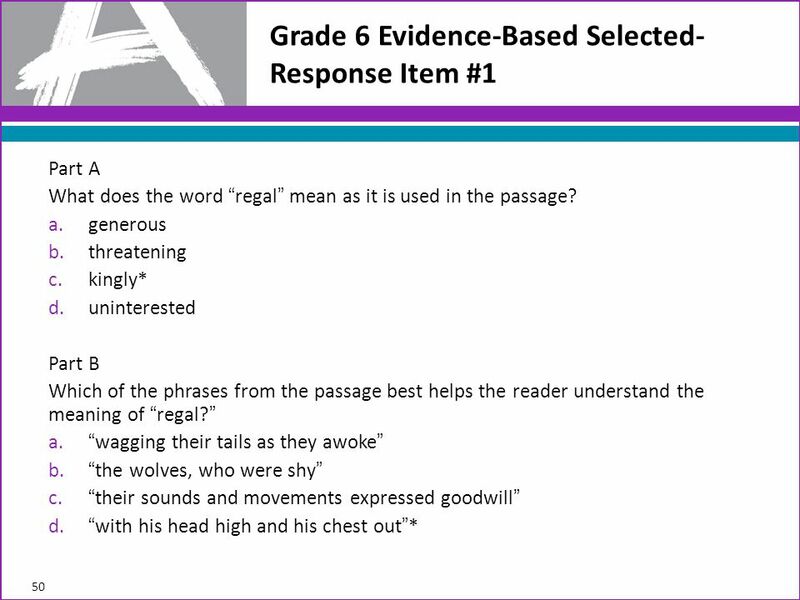 Questions Worth Answering: Sequences of questions that draw students into deeper encounters with texts are the norm (as in an excellent classroom), rather than sets of random questions of varying quality. 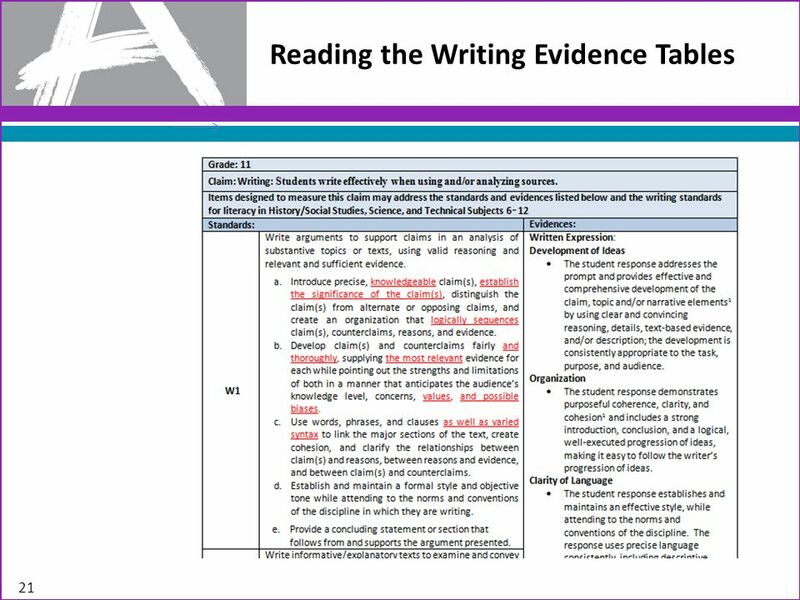 Texts Worth Reading: The assessments use authentic texts worthy of study instead of artificially produced or commissioned passages. 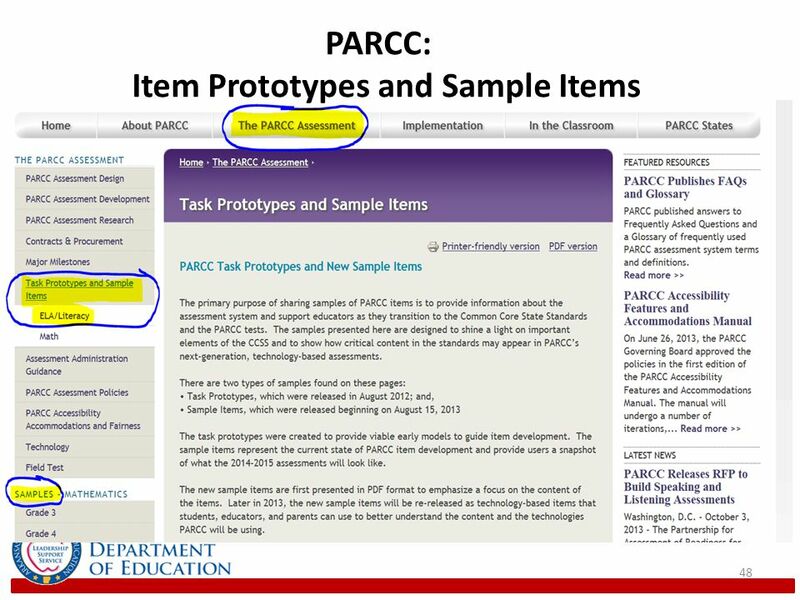 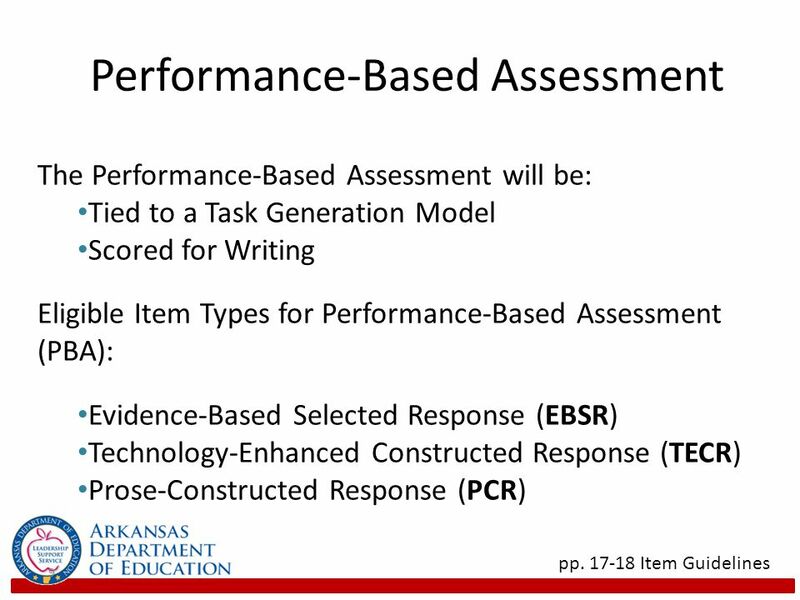 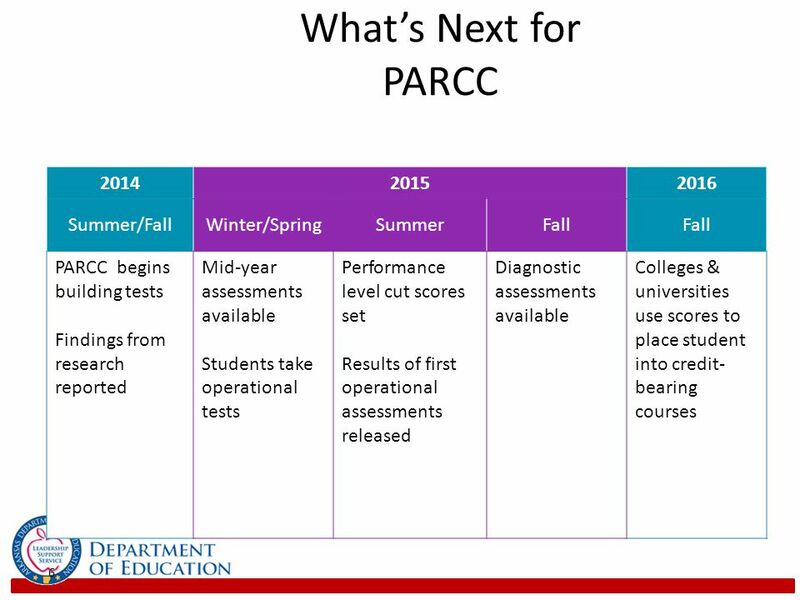 Better Standards Demand Better Questions: Instead of reusing existing items, PARCC is developing custom items to the Standards. 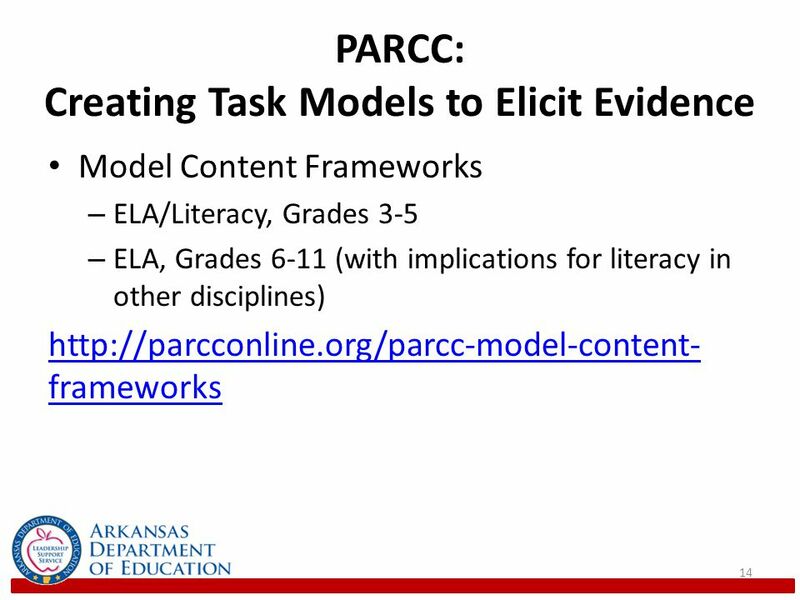 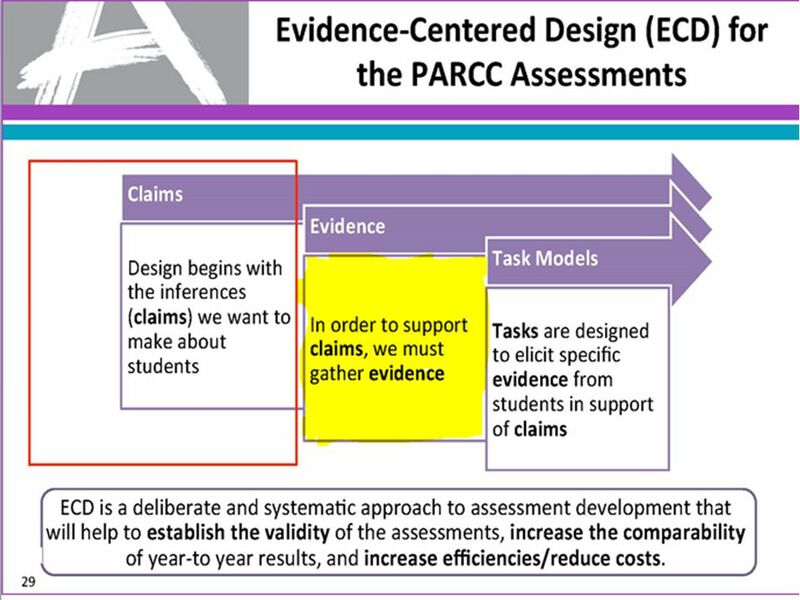 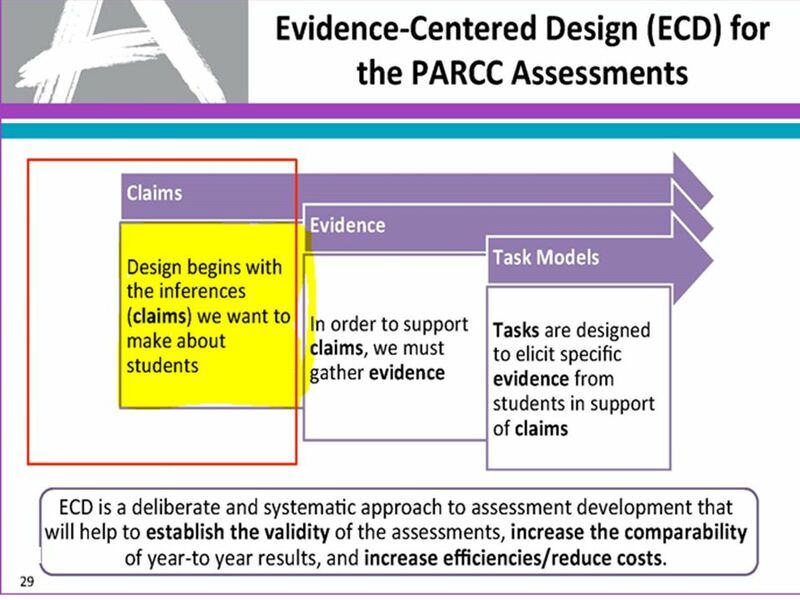 Fidelity to the Standards: PARCC evidence statements are rooted in the language of the Standards so that expectations remain the same in both instructional and assessment settings. 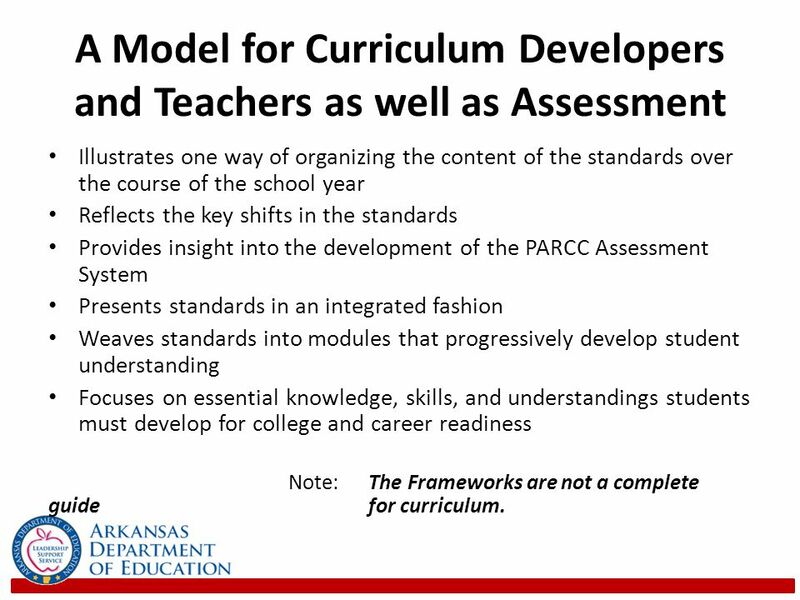 Illustrates one way of organizing the content of the standards over the course of the school year Reflects the key shifts in the standards Provides insight into the development of the PARCC Assessment System Presents standards in an integrated fashion Weaves standards into modules that progressively develop student understanding Focuses on essential knowledge, skills, and understandings students must develop for college and career readiness Note: The Frameworks are not a complete guide for curriculum. 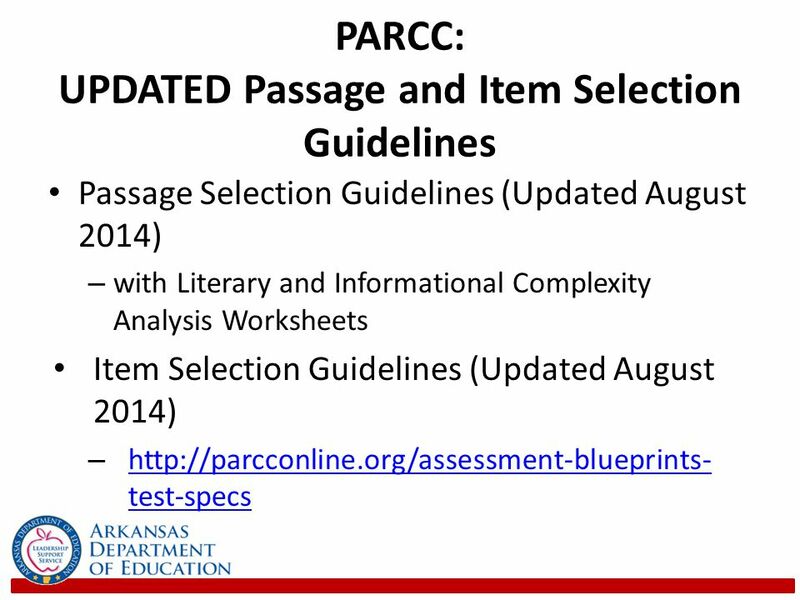 These need to be included in the november day of LDC to plan next module…. 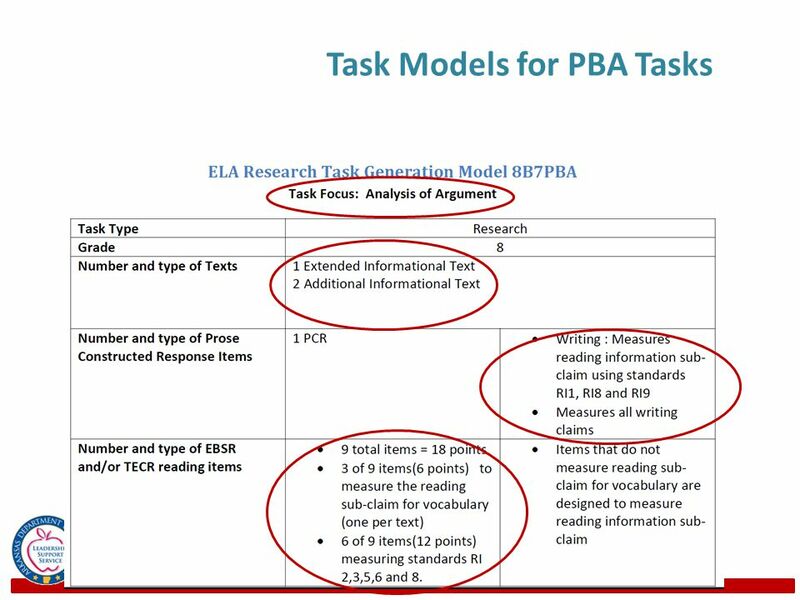 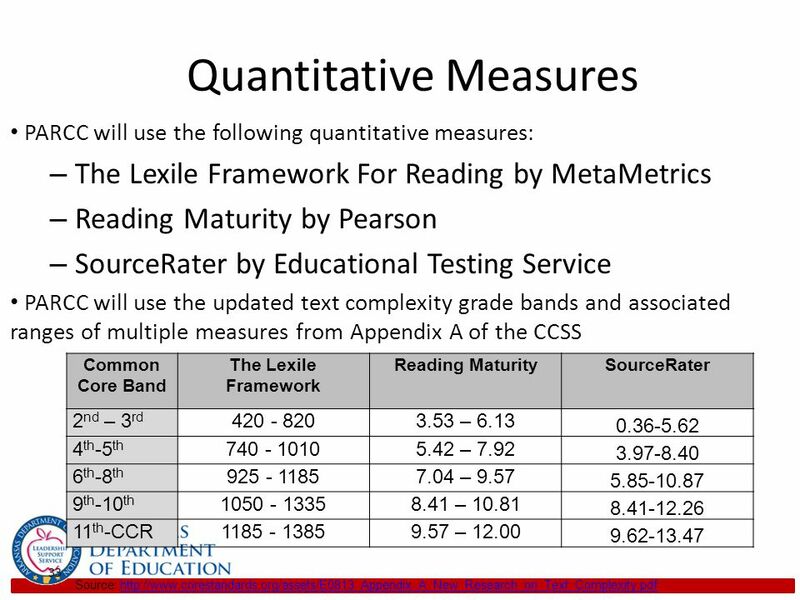 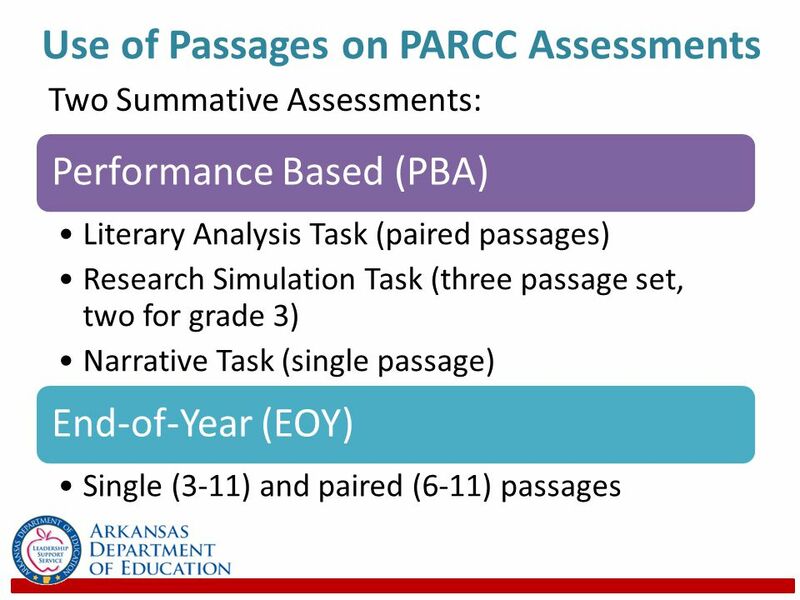 Texts Are Complex: PARCC assessments follow the staircase of text complexity in the CCSS to ensure assessments track student progress each year towards college and career readiness. 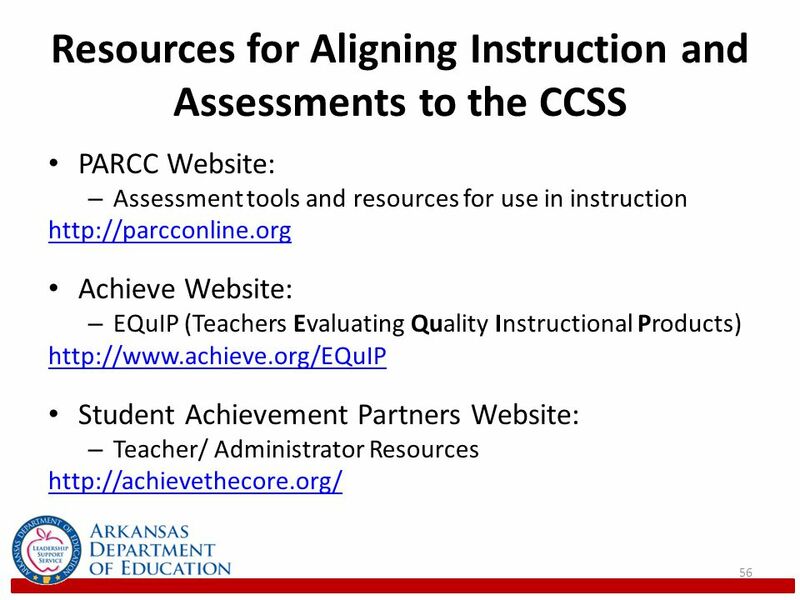 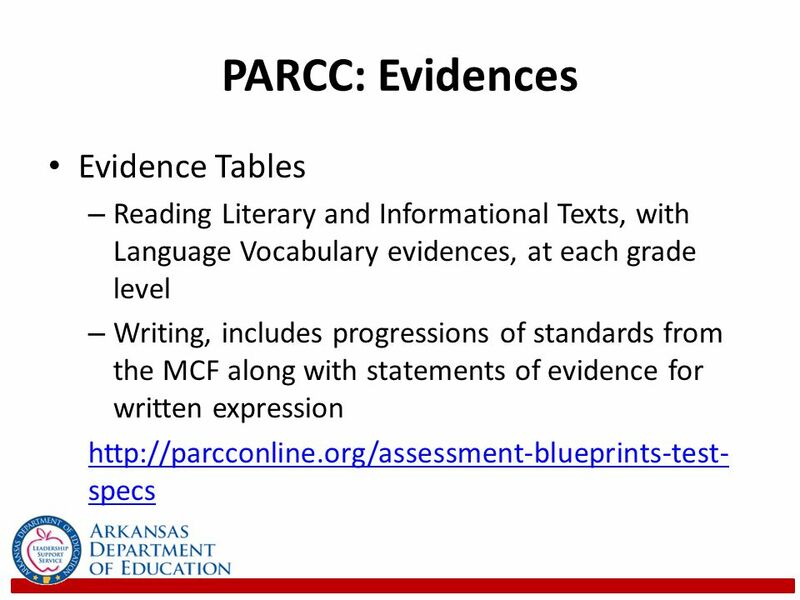 Texts Are Diverse: PARCC texts stem from across the disciplines (e.g. 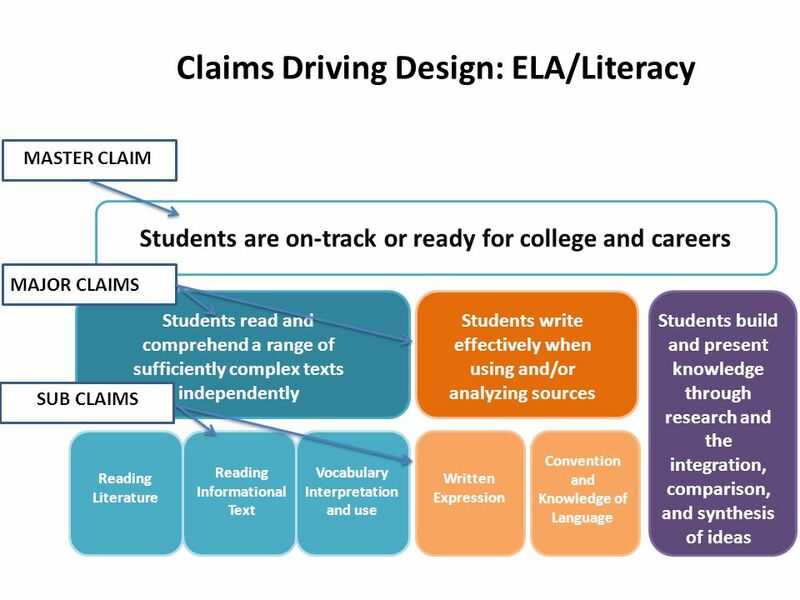 ELA, history, science and technical subjects), are written by authors with diverse backgrounds, reflect the CCSS prescribed balances of literature and informational text, and appeal to a wide range of student audiences. 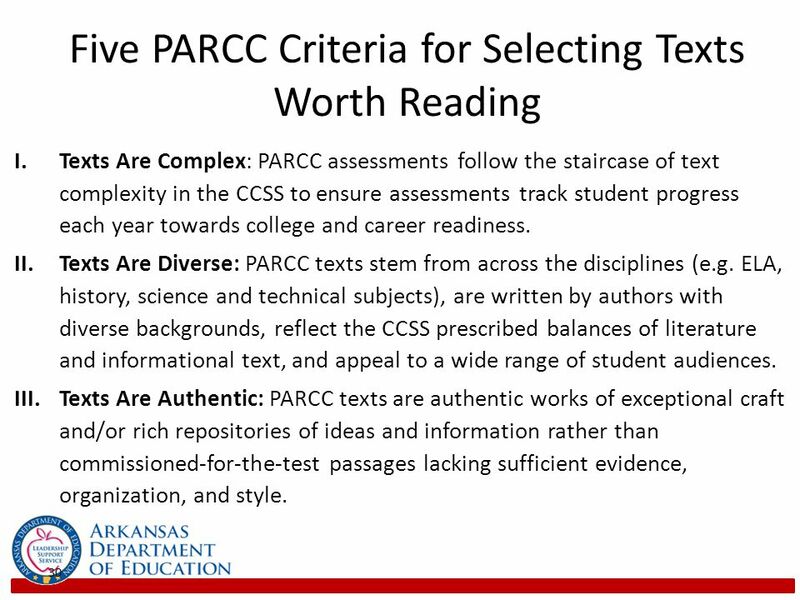 Texts Are Authentic: PARCC texts are authentic works of exceptional craft and/or rich repositories of ideas and information rather than commissioned-for-the-test passages lacking sufficient evidence, organization, and style. 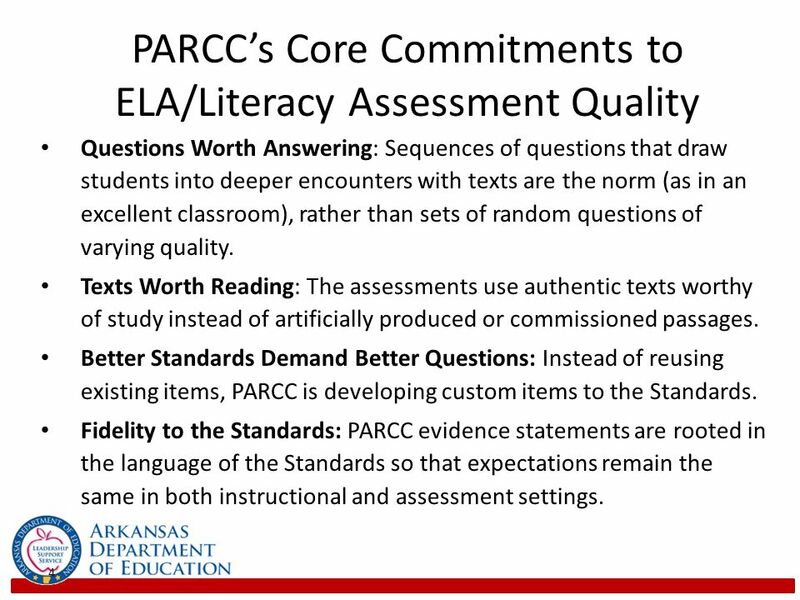 Texts Are Paired Effectively: PARCC text pairings, where required by the CCSS, have meaningful and significant points of comparison that invite questions beyond superficial observations. 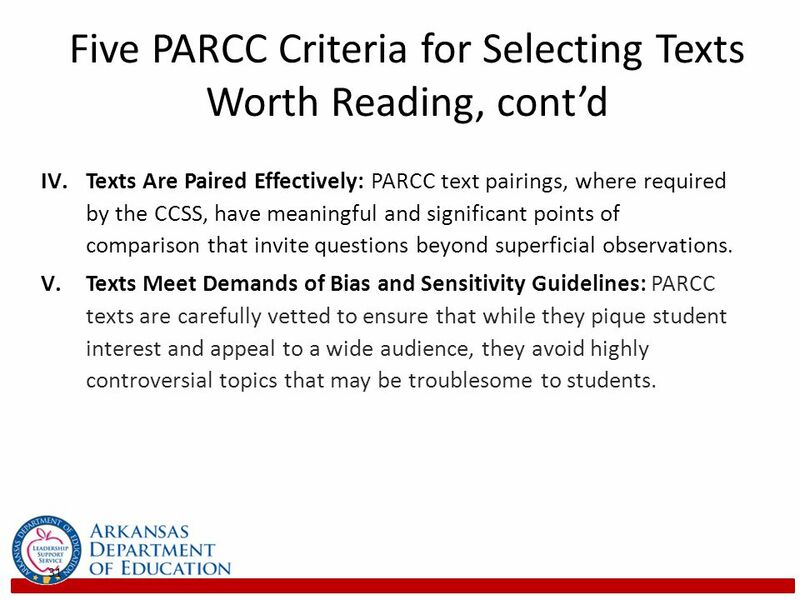 Texts Meet Demands of Bias and Sensitivity Guidelines: PARCC texts are carefully vetted to ensure that while they pique student interest and appeal to a wide audience, they avoid highly controversial topics that may be troublesome to students. 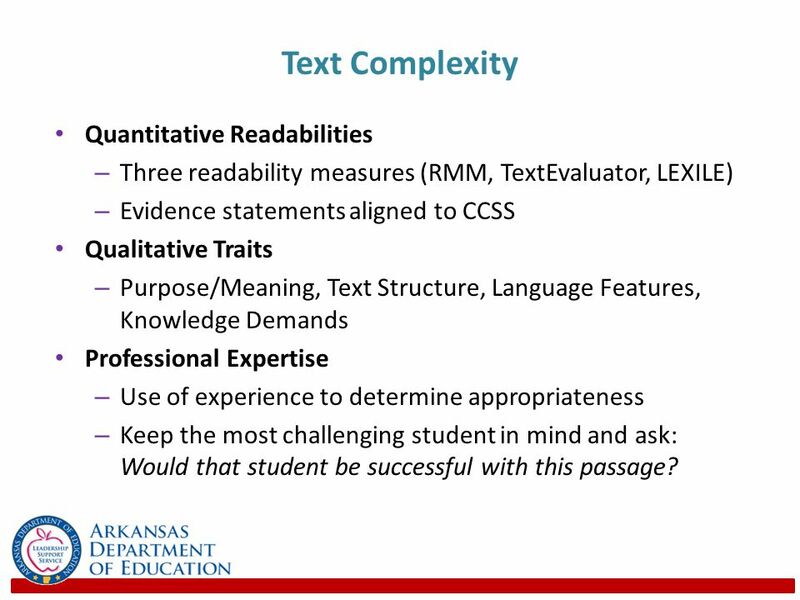 Three readability measures (RMM, TextEvaluator, LEXILE) Evidence statements aligned to CCSS Qualitative Traits Purpose/Meaning, Text Structure, Language Features, Knowledge Demands Professional Expertise Use of experience to determine appropriateness Keep the most challenging student in mind and ask: Would that student be successful with this passage? 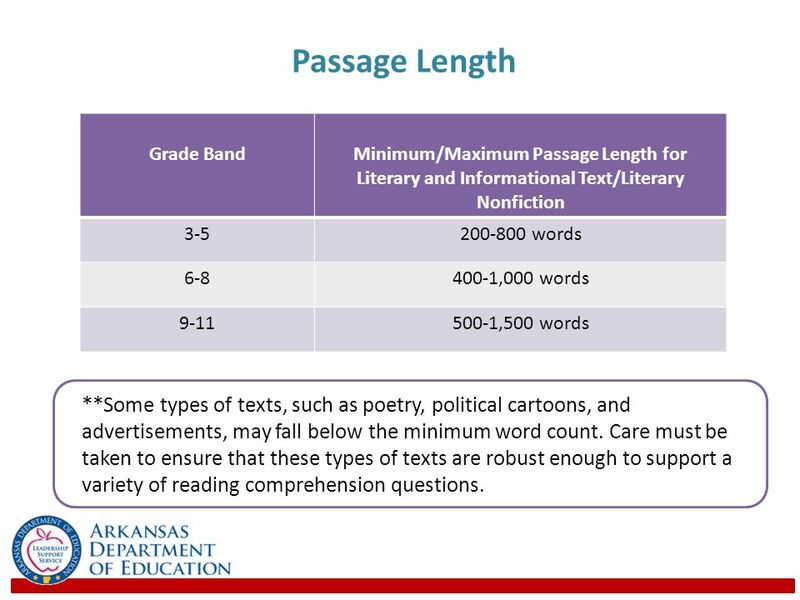 34 Passage Length Grade Band Minimum/Maximum Passage Length for Literary and Informational Text/Literary Nonfiction 3-5 words 6-8 400-1,000 words 9-11 500-1,500 words **Some types of texts, such as poetry, political cartoons, and advertisements, may fall below the minimum word count. 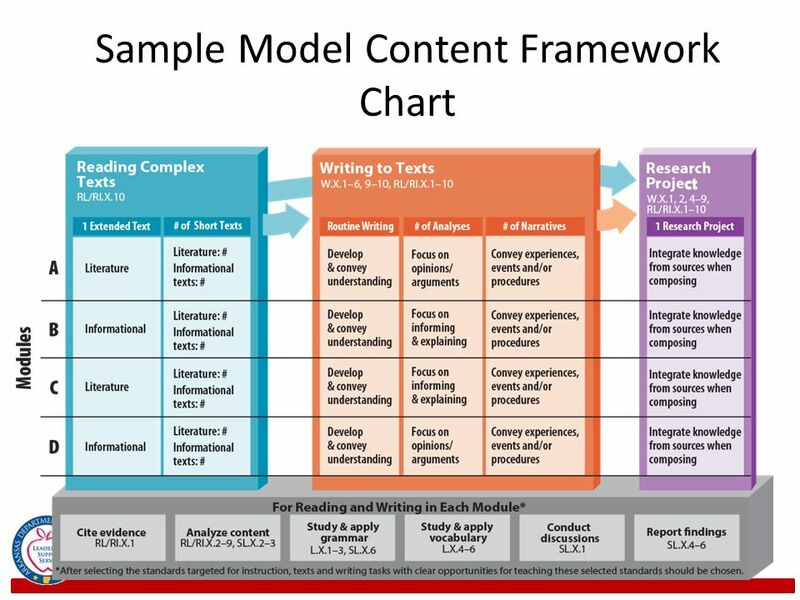 Care must be taken to ensure that these types of texts are robust enough to support a variety of reading comprehension questions. 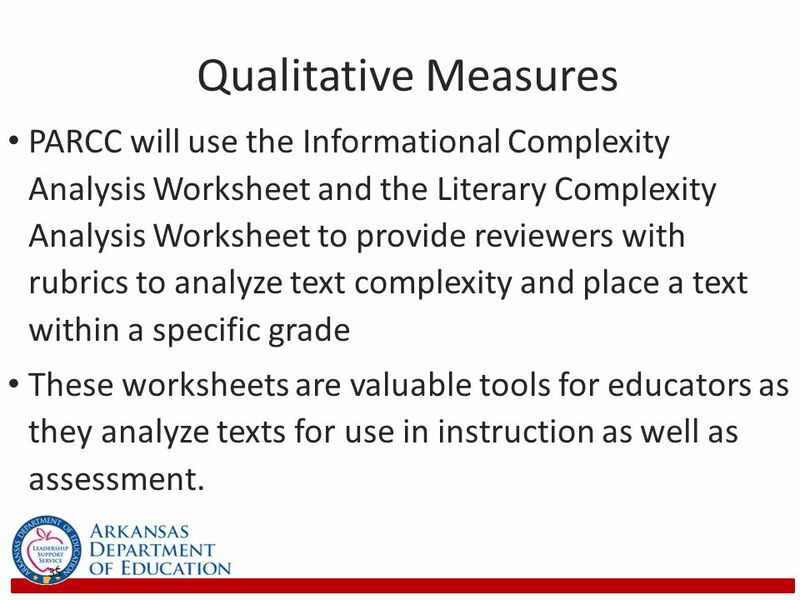 35 Qualitative Measures PARCC will use the Informational Complexity Analysis Worksheet and the Literary Complexity Analysis Worksheet to provide reviewers with rubrics to analyze text complexity and place a text within a specific grade These worksheets are valuable tools for educators as they analyze texts for use in instruction as well as assessment. 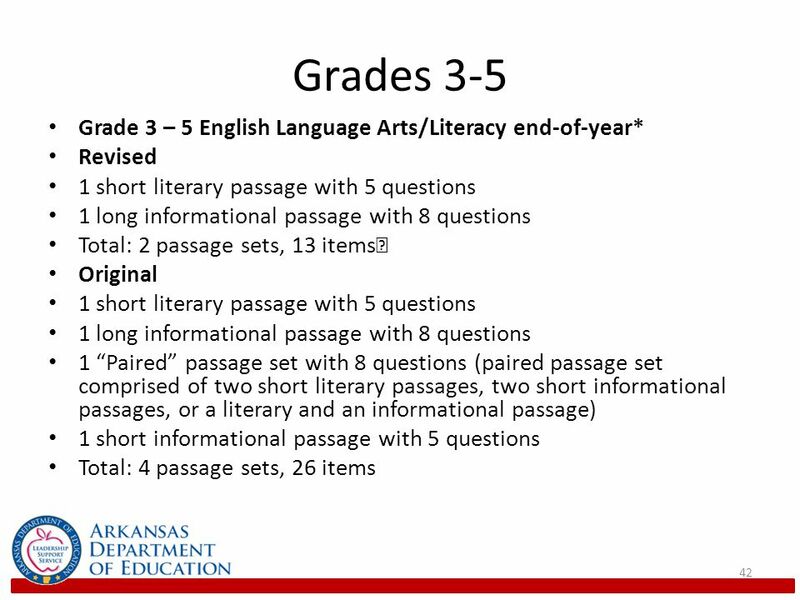 Original 1 short literary passage with 4 questions 2 short informational passages with 5 questions each Total: 5 passage sets, 26 items *All tests will still include some field test questions. 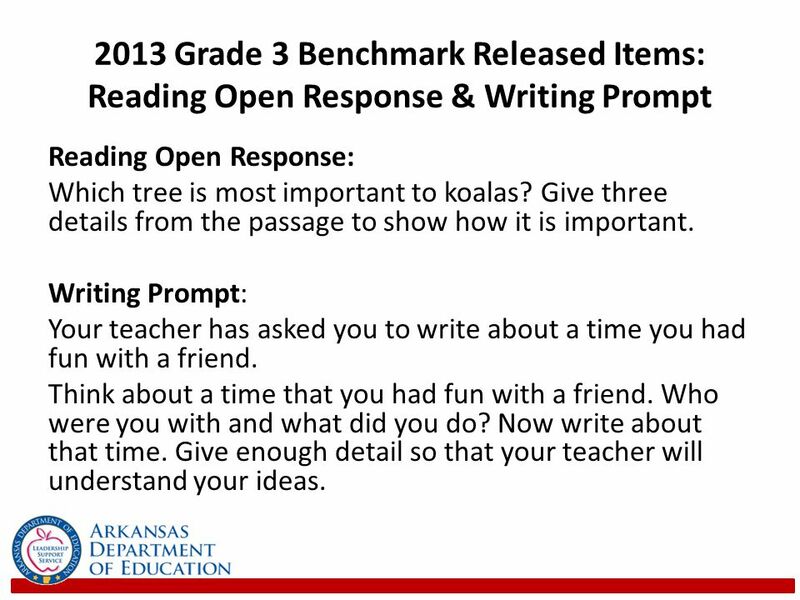 Reading Open Response: Which tree is most important to koalas? Give three details from the passage to show how it is important. 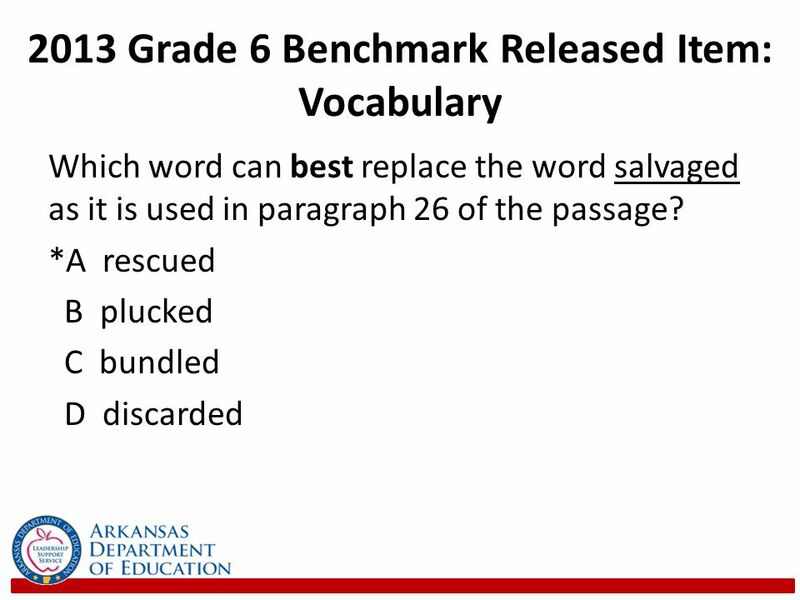 Writing Prompt: Your teacher has asked you to write about a time you had fun with a friend. 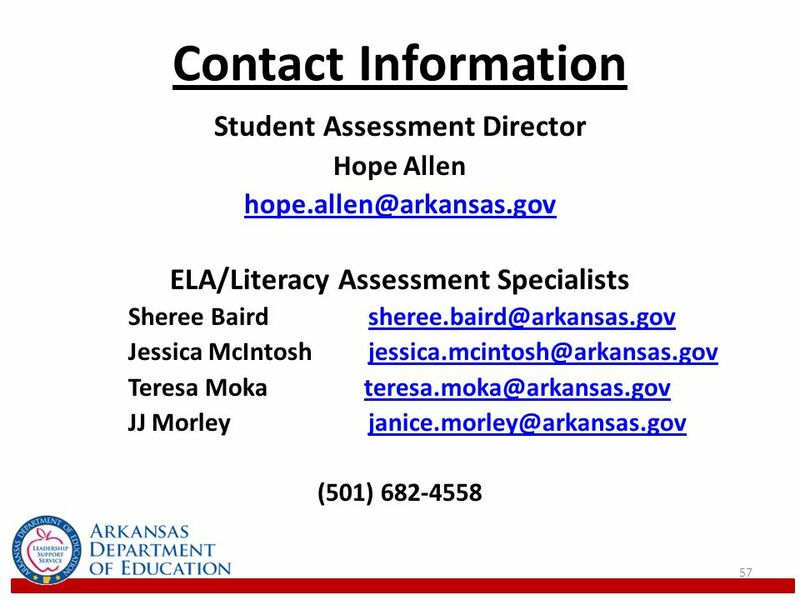 Think about a time that you had fun with a friend. 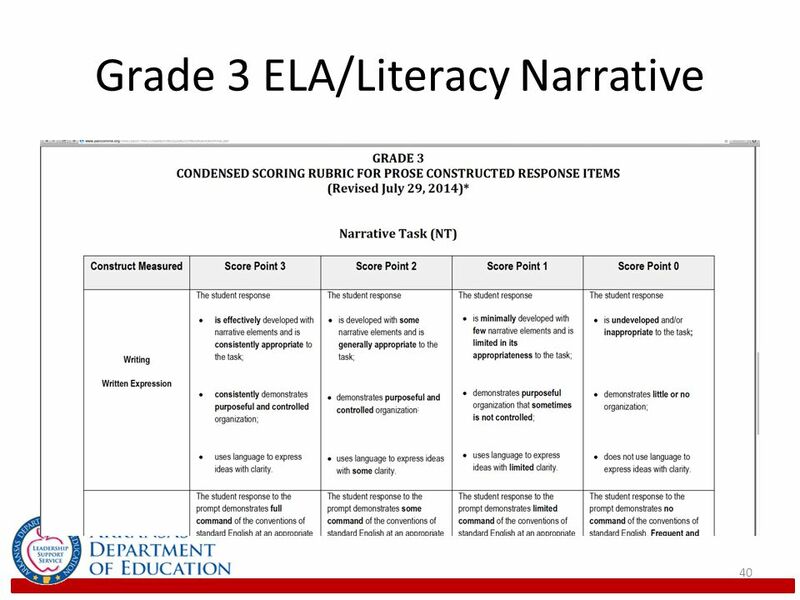 Who were you with and what did you do? 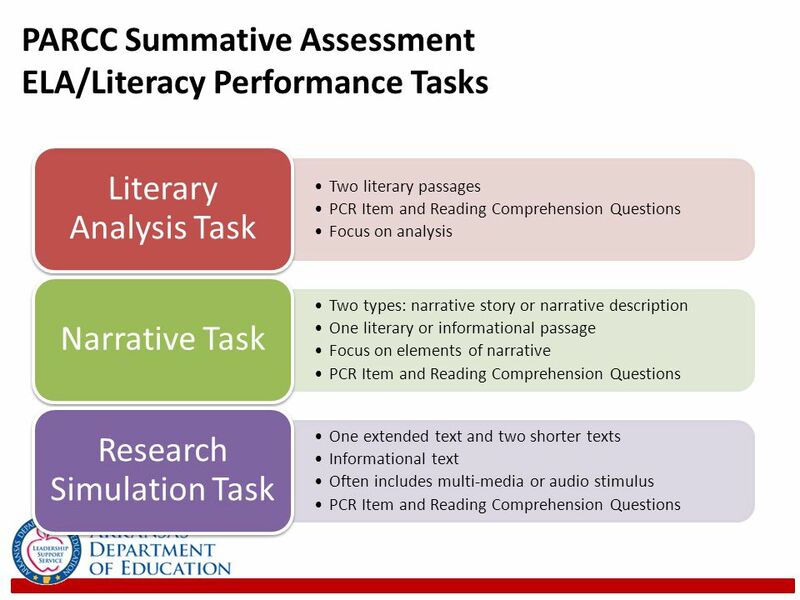 Now write about that time. 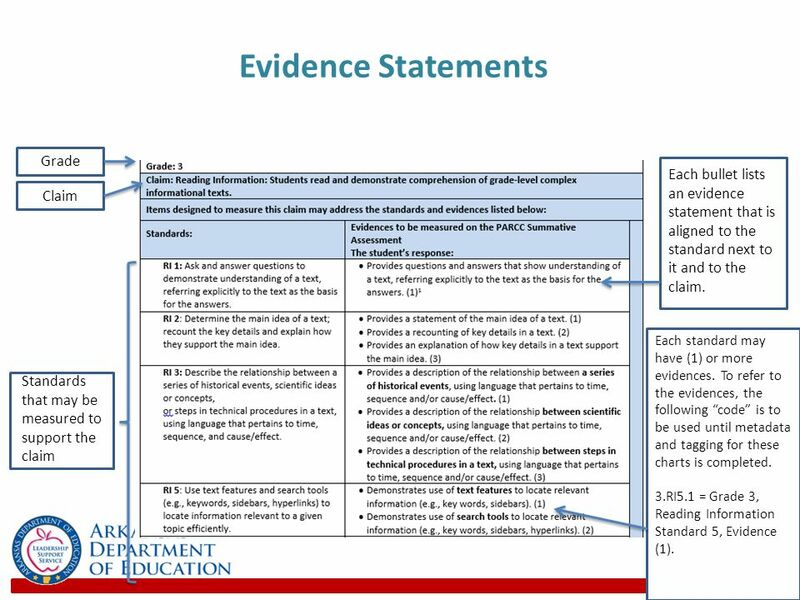 Give enough detail so that your teacher will understand your ideas. 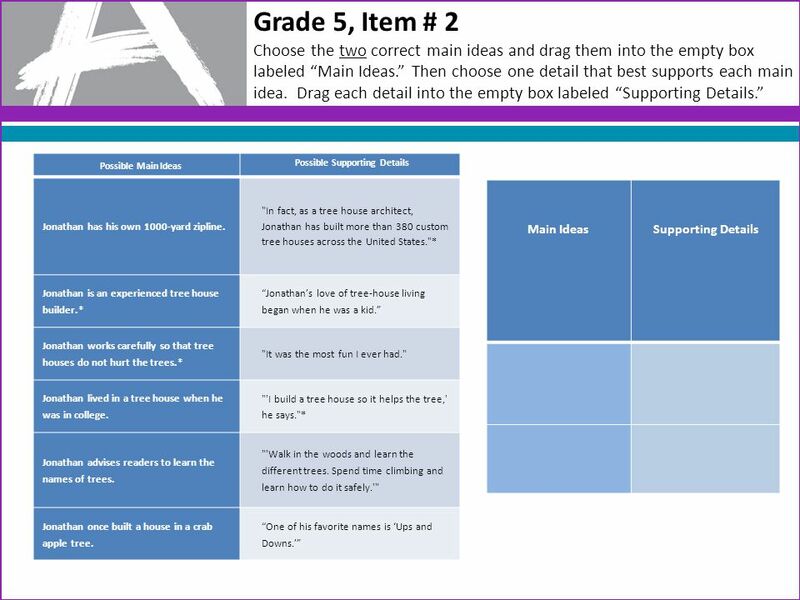 52 Grade 3, Item #3 You have read two texts about famous people in American history who solved a problem by working to make a change. 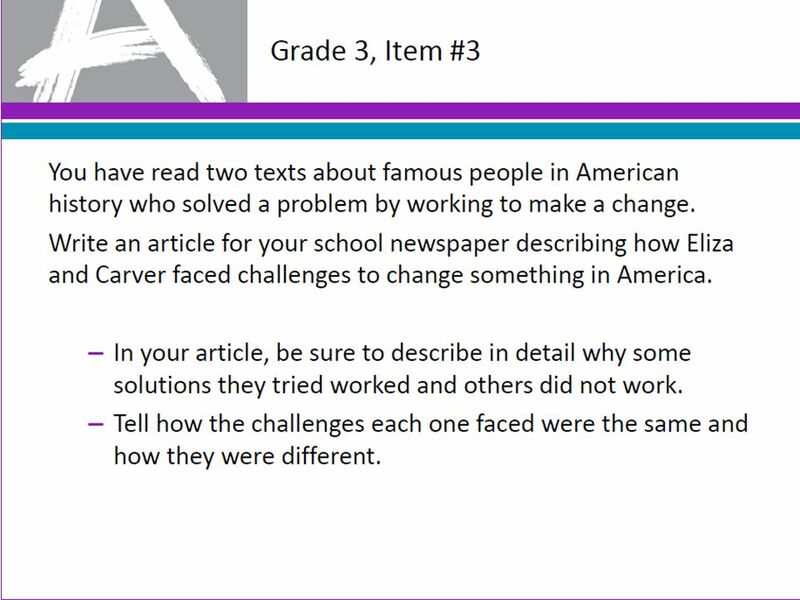 Write an article for your school newspaper describing how she and faced challenges to change something in America. 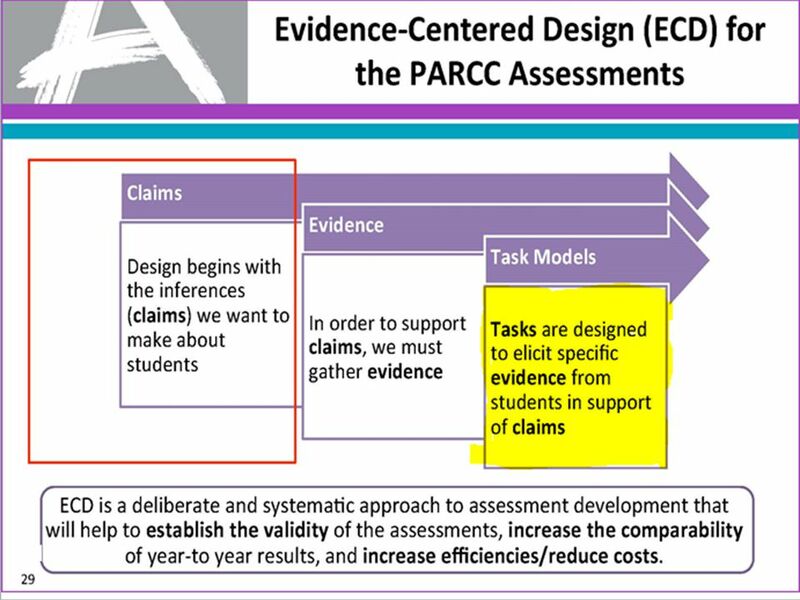 In your article, be sure to describe in detail why some solutions they tried worked and others did not work. 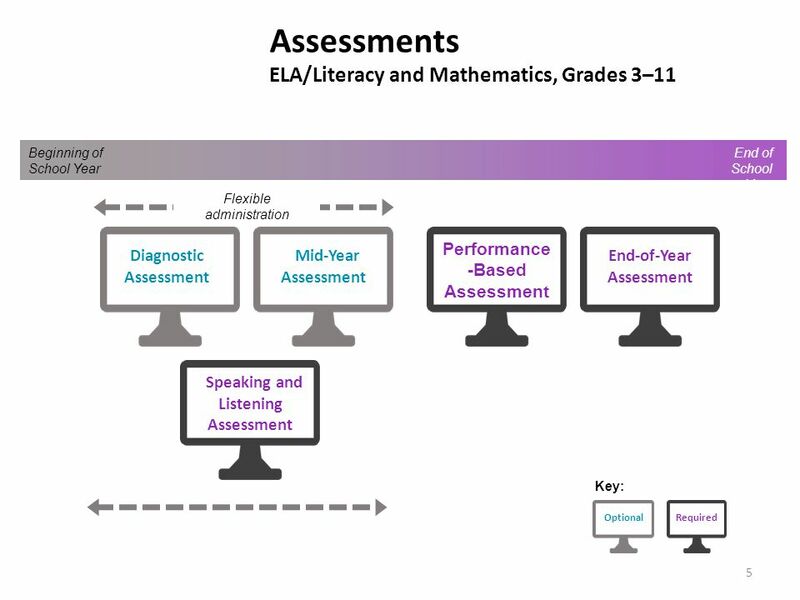 Tell how the challenges each one faced were the same and how they were different. 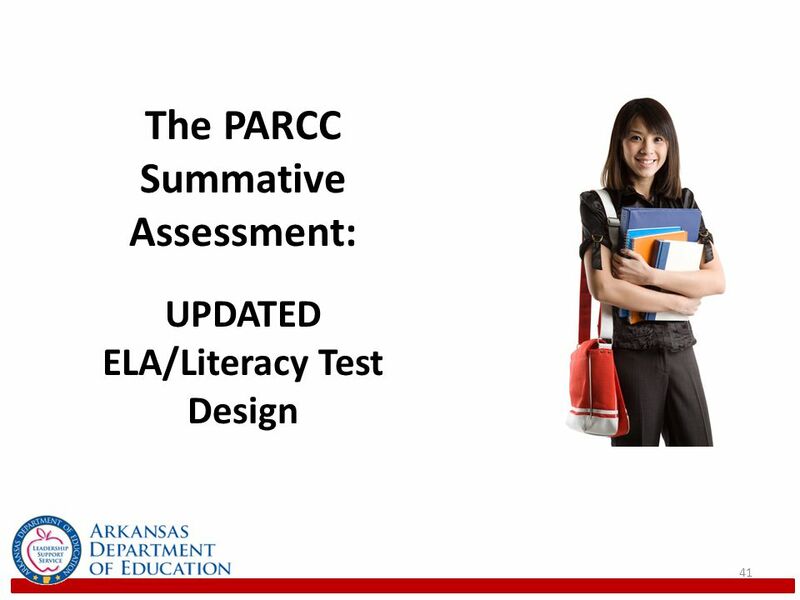 After the verb is what the student is expected to complete. 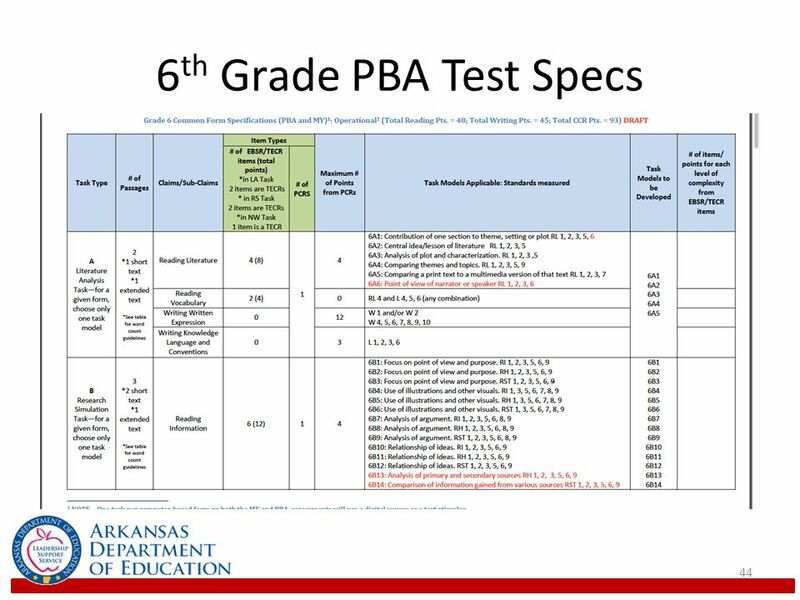 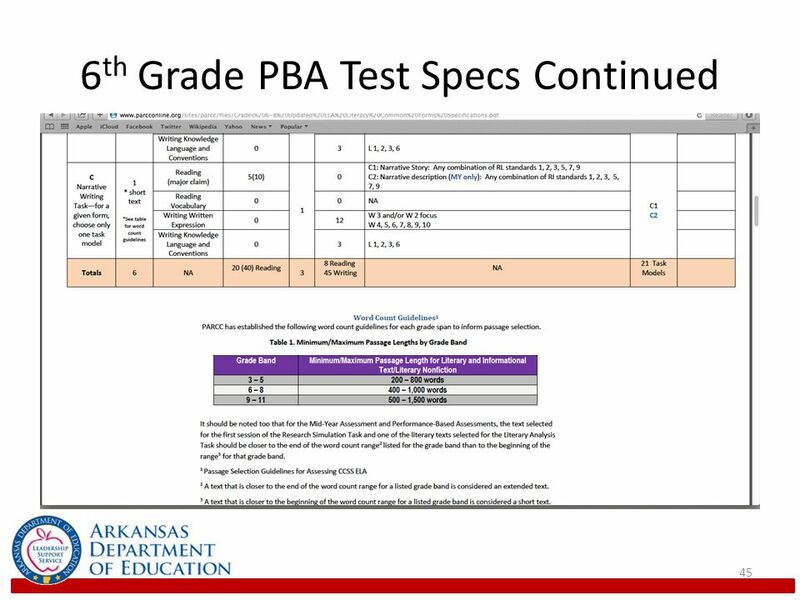 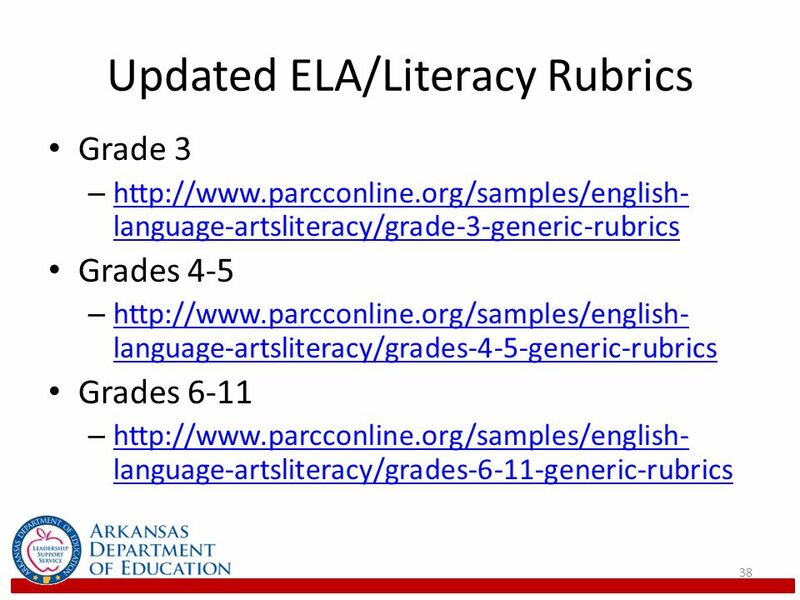 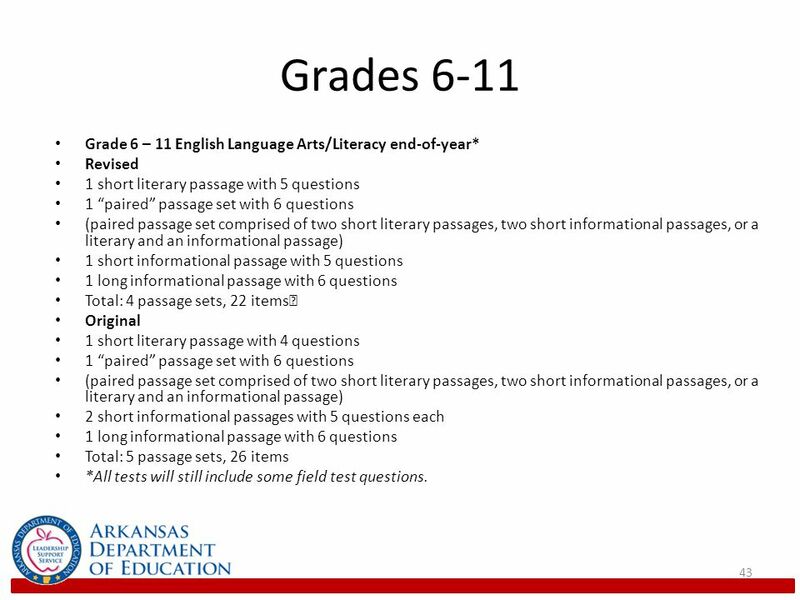 The online ELA/Literacy PBA 3-11 practice tests were released last spring. 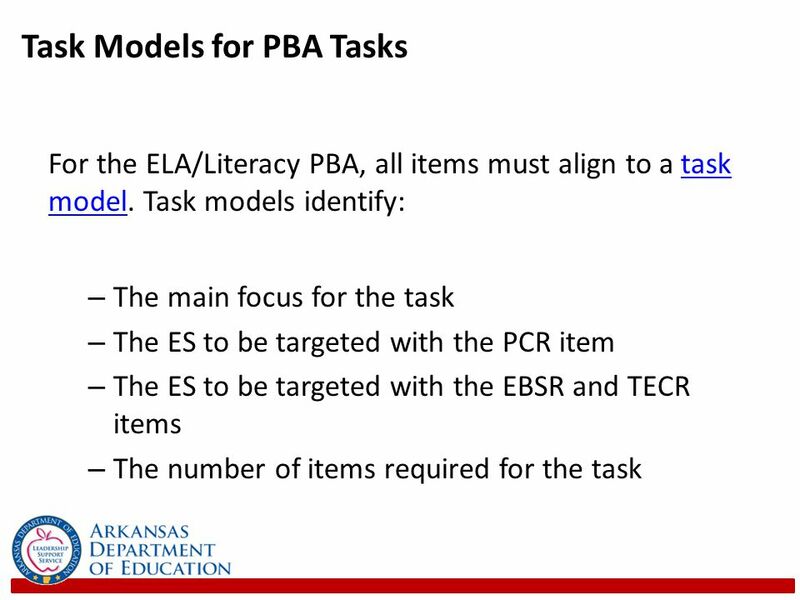 They can be accessed at The paper ELA/Literacy PBA practice tests are scheduled to be released in November. 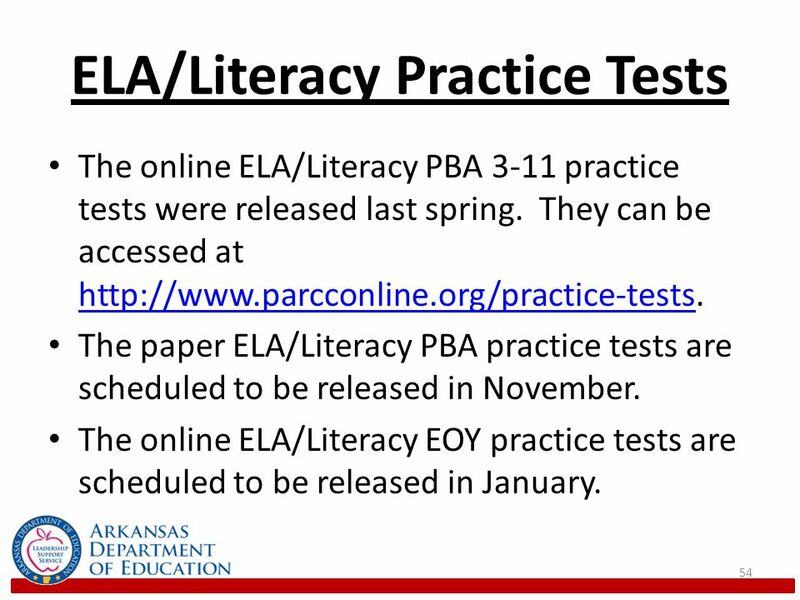 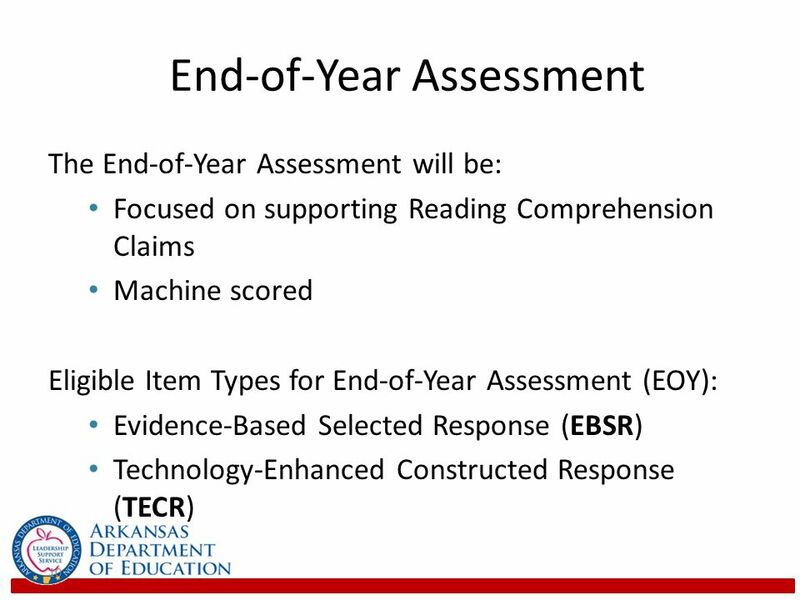 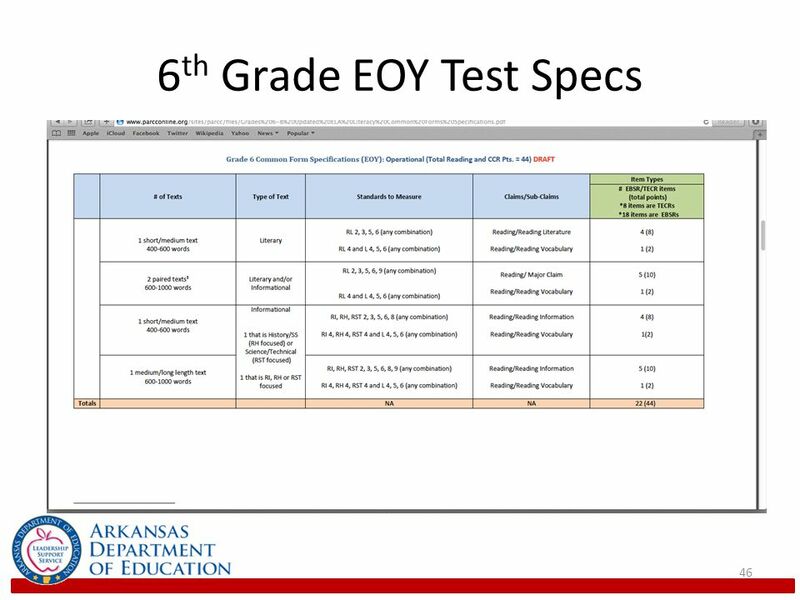 The online ELA/Literacy EOY practice tests are scheduled to be released in January. 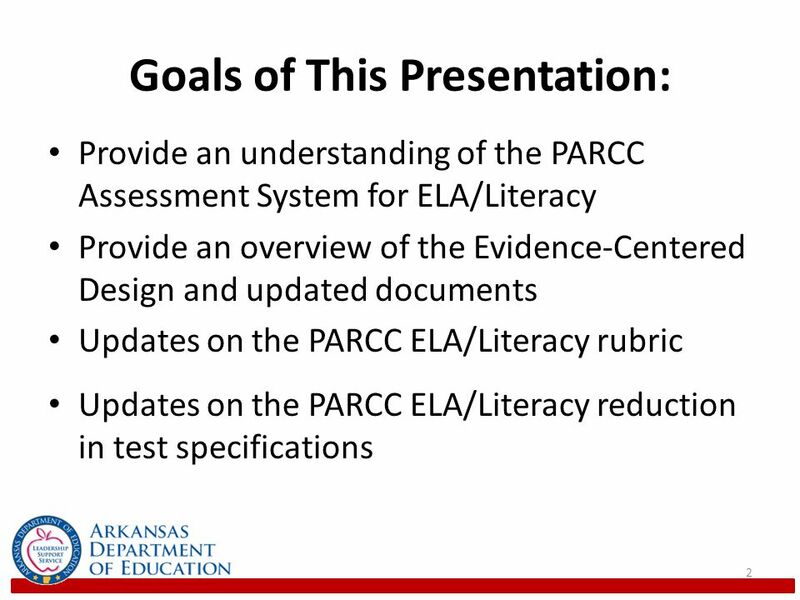 Download ppt "Goals of This Presentation:"
Common Core for Social Studies Overview 1. 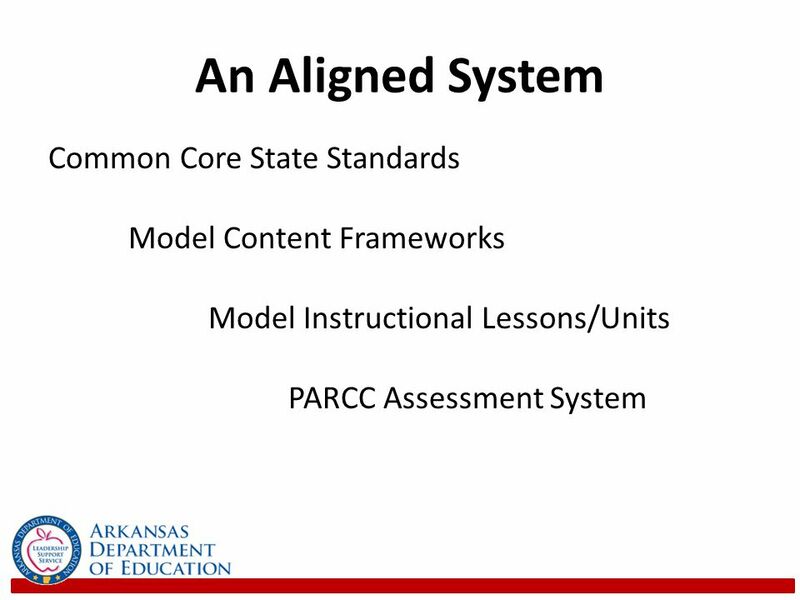 What is Common Core? 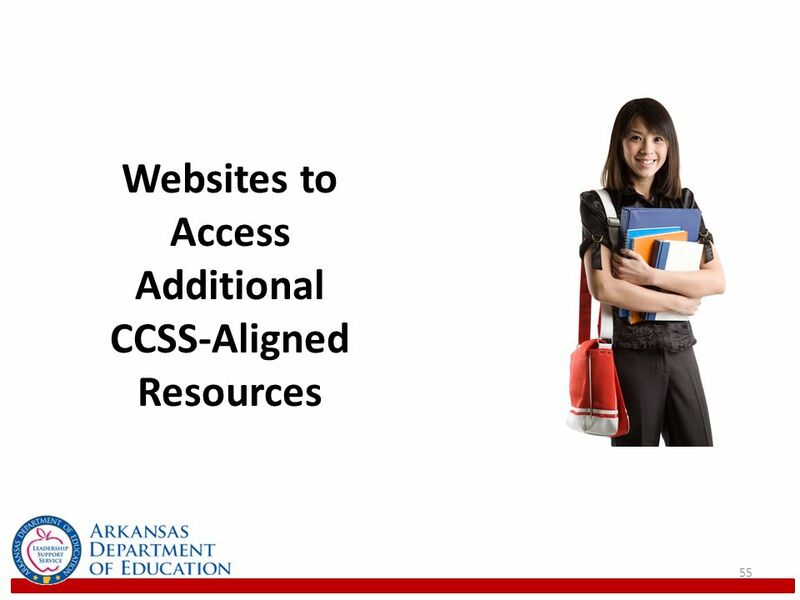 knowledge and skills students should have within their K-12 education so that they will. 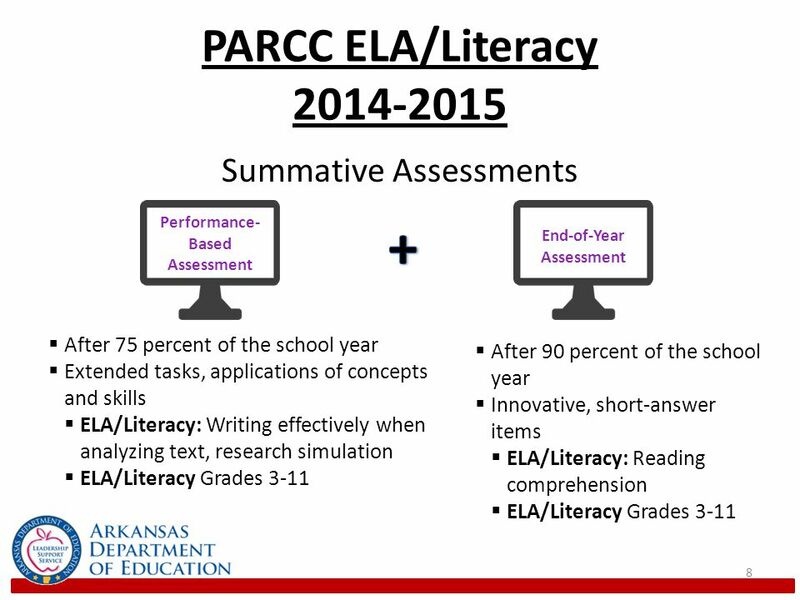 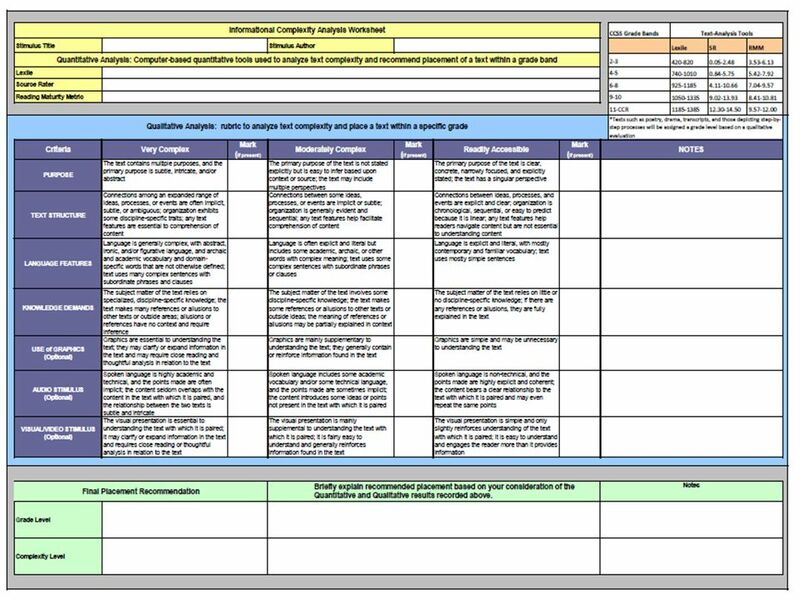 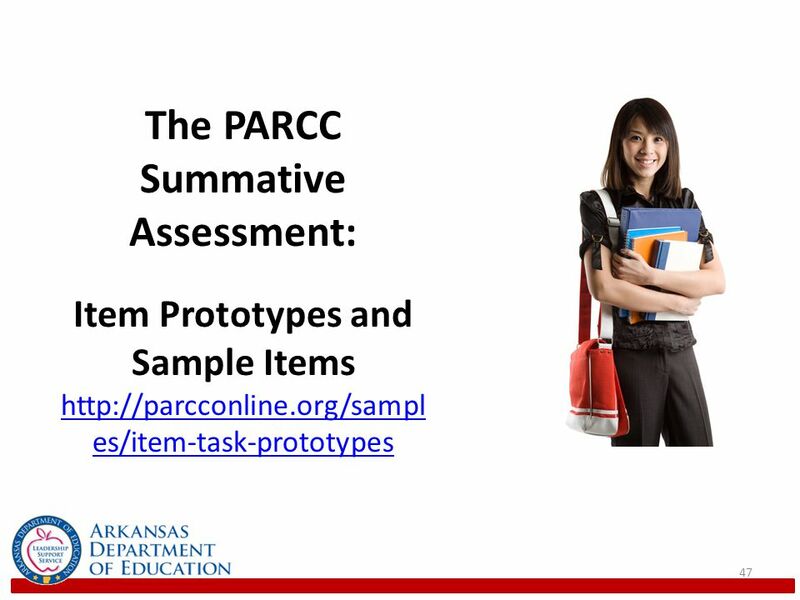 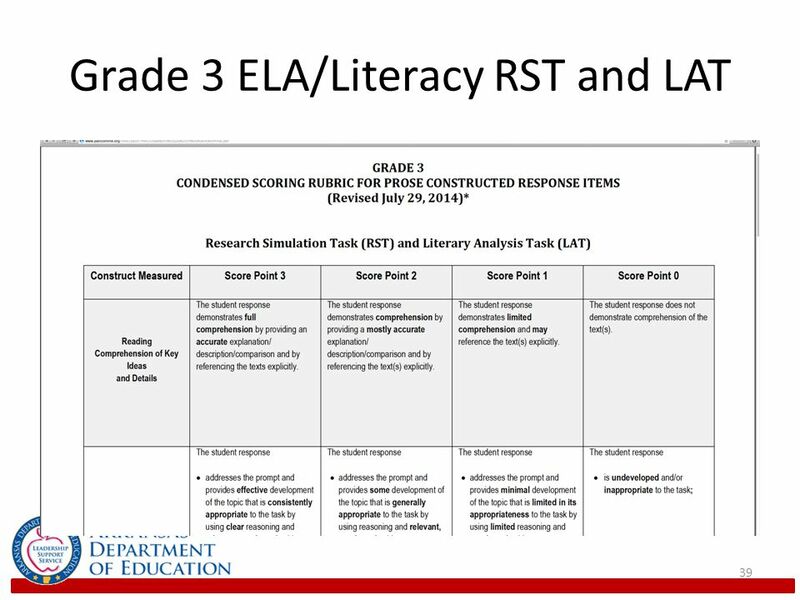 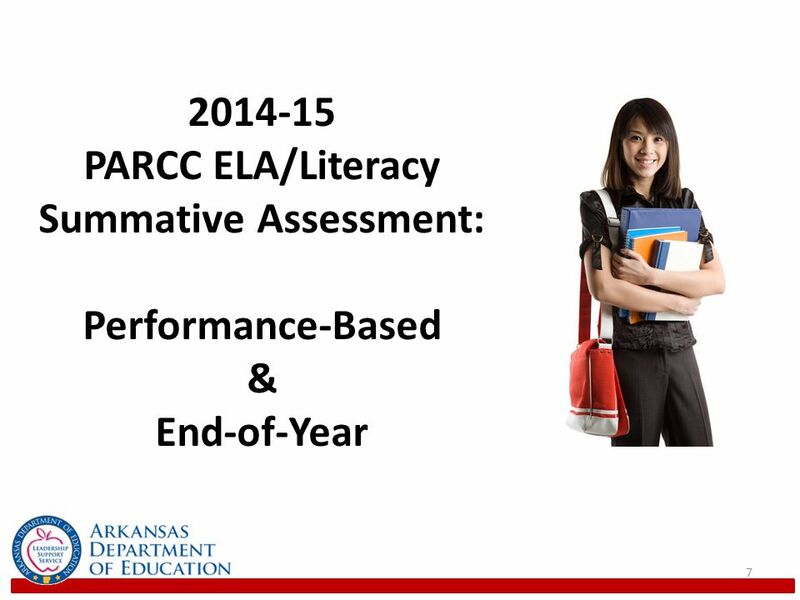 New Approach to Designing Performance Level Descriptors: PARCC ELA/Literacy Summative Assessment. 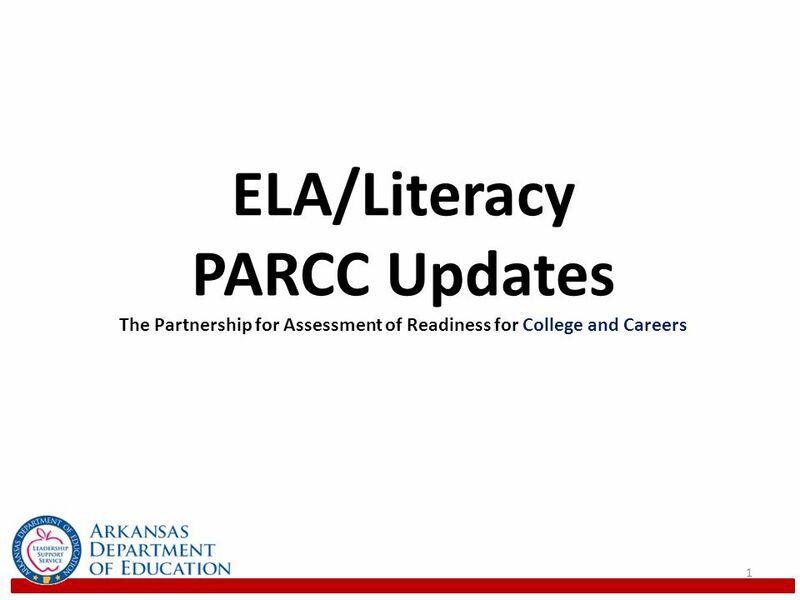 The Partnership for Assessment of Readiness for College and Careers September 2013. 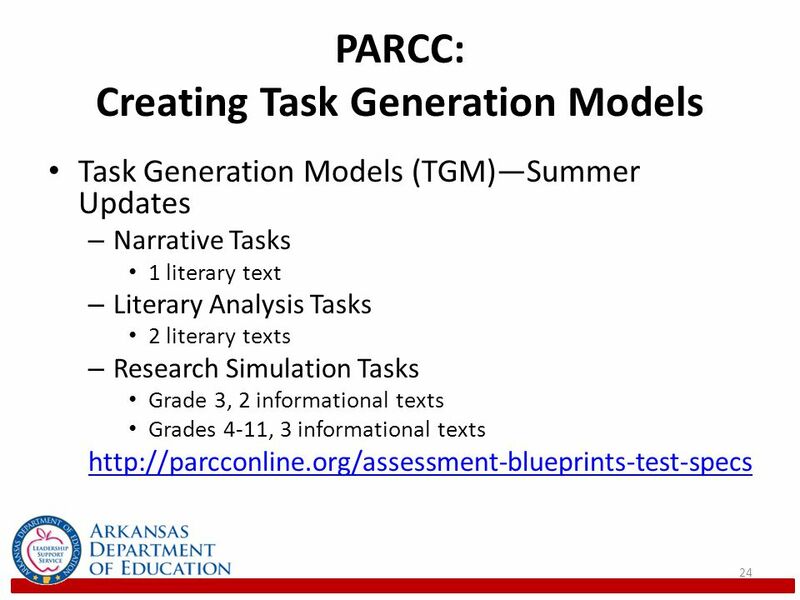 Shifting Gears! 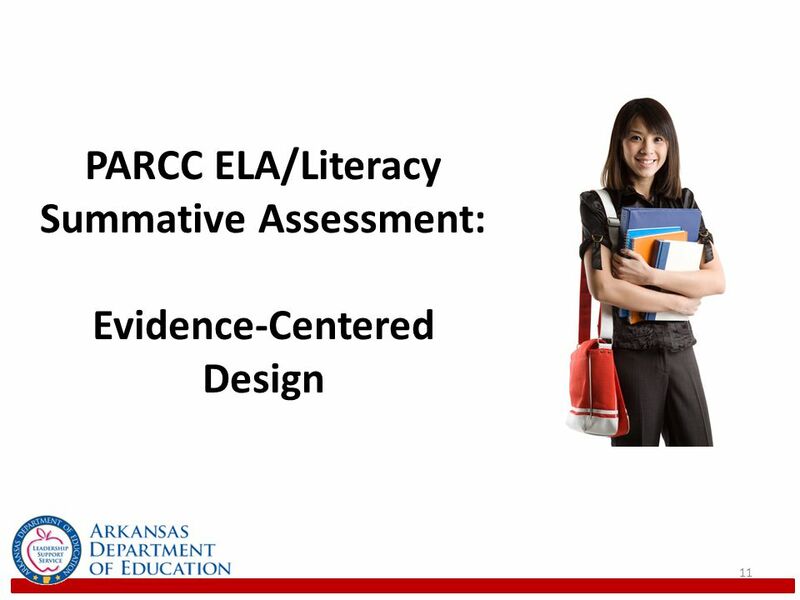 A Professional Development Session Designed to Support Turnkey Training on the Shifting Gears Initiatives Educator.